Learn the 6 best ways to make your money work for you — and lay the foundation for a Rich Life today. ING switched to Capital One 360. I used the money I saved to buy an engagement ring.So set up a sub-savings account and start automatically putting money into it each month. If you need help, check out my article all about sub-savings accounts to get started. I was wondering if you have a guide on annual mutual-fund investing? For example, I have not a clue when it comes to investing, stocks, bonds, mutual funds, etc. However after reading all the great advice on this site I am excited and want to start investing. I am 27yrs old and want to invest in something that will be fairly safe but will be rewarding also. I have already setup my finances and this is my next step. Any advice on mutual funds for those like me? Thanks again for the awesome advice! 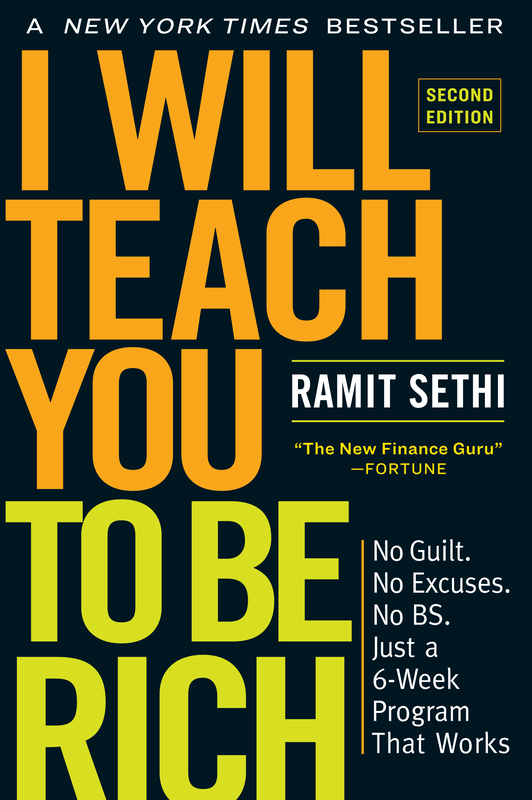 Ramit's book "I Will Teach You To Be Rich" covers investing in index funds like you described. "The Bogleheads' Guide to Investing" is also a great resource. I take their advice so seriously that my portfolio is modeled on the index-based format. Index ETFs. Simple and low fees. If nothing else, just put money in an S&P 500 Index Fund. They all track the same index, so just look for the lowest expense ratio. I haven't read Ramit's book, but that would probably be a good place to look when you have the time. My husband and I are second marriage coupe. My husband is 58. We own our home worth about $200,00 and have no outstanding debt. We have $100,000 to invest and would like get around 8-10 percent in mutual funds (after fees) and we want to start withdrawing in 5 years ($8,000 a year) We don’t want to run out of money. Right now have what little money we have in CDs. What suggestions would you have regarding mutual funds that althoughI know the earning fluctuate — average 8-12% with minimum fees and how would this play out in five years when we want to start withdrawing a bit each year??? If your investment horizon is 5 years, the risk you need to take to earn 8-12 percent is too high. Anything that could make that much (most likely equities or equity funds– i.e. "stocks") could lose it as well. When your time horizon is 5 years or less, you don't have time for the market to swing back if it tanks (think 2007), so most experts would advise a safer investment (and there is no safe 8-12 percent return investment at today's interest rates). It's not the answer you want, but I'd look for ways to earn more and perhaps put that money in a more aggressive investment, knowing you have your "safe" money available to hold you over in the event of losses. Just letting you know the article on survivorship bias is no longer available on its Web site. I appreciate all the information, thank you!!! Considering your 2nd largest reader’s age group is 30-39, and you want to increase the number of women who read your advice, please do consider adding more financial information for that age group and gender. Sexist much? The article is fairly broad talking about anyone, male or female. You need to actually read before you start getting all pc on everybody. Hi, I am a regular follower of your articles. Just like other ones this article too is informative. I have started my investment plans with Fair Investments ( http://fairinvestments.se/ ) and will keep all your points in mind. Thanks for sharing. I’m a Nigerian living in Lagos. I’m 35 yrs old. I work with an Events Management company. I earn an equivalent of $880 per month. I’m financially illiterate but i do really want to develop myself and make money work for me. A few years ago, like 8 or 9yrs ago, as a fresh graduate, i did invest in some bank/company shares worth $125/$62.5 at that period but i don’t know what has become of them nor how to track it. Two months ago, i made a conscious effort to invest in a low capital investment fund called FBN Capital after listening to a radio programme. Now apart from making some commitments towards this investment i really do not understand how it all works and will really love to educate myself. I will appreciate if i can get tips, manual or stuff that can really help to become financial savvy. I love this article, I really want to make some steps so money can work for me . I do admire investing. And I don’t know the best way to do it , I have ksh 100,000 to invest what is the best investment I can go for. Advice please. If you want to make some money then check out the S&P 500. I wish I was in it right now… had it at 7.80 four years ago and got married and sold it all. It’s still a great buy and will likely see 70 within ten to fifteen years. Dividend is 7.8 percent a year plus inflation on top of that. Also, as you begin to make money, GUARD IT WITH YOUR LIFE! There are so many scams and stupid investments out there. Believe in yourself and make certain you’re not investing your money foolishly. This sounds like common sense yet it happens all the time. Hi i have 70000$ how to work with my money and be a successful person in my economy. Hi I’m 16 years old and recently started investing in precious metals. I’m interested in investing my money in other stuff but have the foggiest idea on where to start. Can anyone help?? This. This is how you write an article! Well done. I agree how the article illustrates the importance of long term investing and managing risk. It is a great idea to take on long term investments in the earlier stages of life so they can grow to a high return. It is also good to worry more about hedging risk when you are approaching retirement and your risk tolerance is minimal. I think that long term insurance would be something to invest in middle stages of life because it provides security when the time comes to exit the workforce. OK. What I wish someone had told me (made me do!) in my twenties. Save SOMETHING!!! Start NOW. NO MATTER WHAT. No matter how insignificant you think it is. I was a poor as a churchmouse musician trying to make it. Then had a family with all that expense. That's OK.Not complaining. BUT… I still should have saved SOMETHING! Anything! I finally started when I was 52. $50 per month into an IRA. AUTOMATIC. Increased as I could. When I hit $3000 I put it into Vanguard Index fund. Since inception – dollar averaging/compound interest – 10.4% (past 12 months gain 14.2%). But you know what? It's NOT ZERO. Read Ramit's book. Start saving now. Rock on with your bad self and your rich life. Buy AAPL, GOOG, NFLX and AMZN. Don't ask, just do it. And back up the truck when you do. This is great! I loved your advice about automatic investing and have most of my expenses set up to go out around the first of the month. I'm also following the "7 Jar system" that is outlined in "Secrets of the Millionaire Mind." Something I recently found out as well is that it's possible to earn double digit returns on a retirement account and grow it tax free! WOW, was I blown away! And for paying off debt, I've recently learned that it's possible to pay off student loans, mortgages, car loans, and credit card debt in a fraction of the time without changing your current monthly income and expenses. Though I don't have those (I used scholarships to cover my school after reading "Confessions of a Scholarship Judge" by Josh Barsch-https://www.amazon.com/Confessions-Scholarship-Judge-Easily-Scholarships-ebook/dp/B006LYXPMO and I currently rent), it was super fascinating to find out. The CashFlow 101 board game also helped me learn more about income, expenses, assets, liabilities, doodads, and money management. #4 is the best advice-always be learning and implementing what you learn.